S I G N & D I G I T A L G R A P H I C S • May 2018 • 55 for standoffs, which make it a popular product among sign makers and other related industries." Pountney has seen standoffs used in other unsuspected places, such as in the assembly of massive Christmas trees and displays mounted on barges, he says. "There's millions of ways you can use them. It's unlimited because it's people's imaginations," Pountney says. "There are very few businesses that don't have a use for them. They can be used in homes, too." For instance, posters and prints can be printed on clear acrylic and hung with a standoff system, or frames can be given the system's three-dimensional effect to add to the visual impact and the décor in the home, Pountney says. "It looks fantastic. It's extra elegant. It's got a great visual impact. It's a much more modern way to display graphics," Pountney says. Benefits/Drawbacks of Standoffs Standoffs have several benefits beyond improving the appearance of the sign or display, such as easy changeability, Howard says. 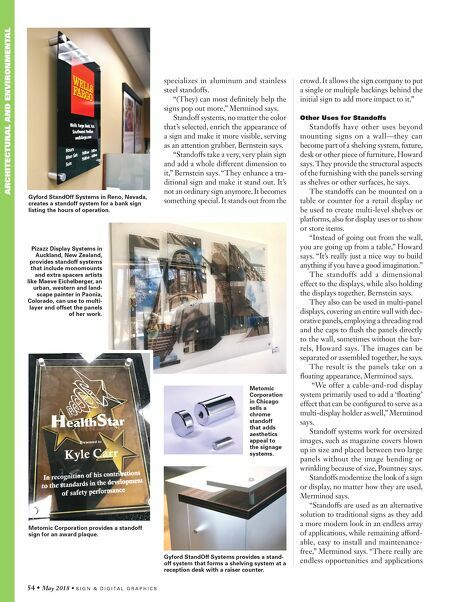 For directories or exhibits, for example, the mounting hardware can be unscrewed and the printout or object can be replaced with another item with- out requiring new hardware or panels, he says. The drawback to the standoff systems is in the price point, because the hard- ware costs more than the few cents of a screw, Howard says. "These things are not sold at Walmart," Howard says, adding that the average homeowner likely will not pay the higher price to hang a picture, though some will make the investment. "A professional organization will because they want that look." Sign makers can add to their pricing structure from the added cost of produc- tion of the mounting systems, Bernstein says. "If you're the best sign maker, you want to give the finest hardware," Bernstein says. "Our hardware is made here in America. Everything is made out of aluminum. It's a very durable material. And it gives a nice presentation." In effect, standoffs make signs and displays more interesting, Pountney says. "You can have multi-layers. You can offset some panels," he says. 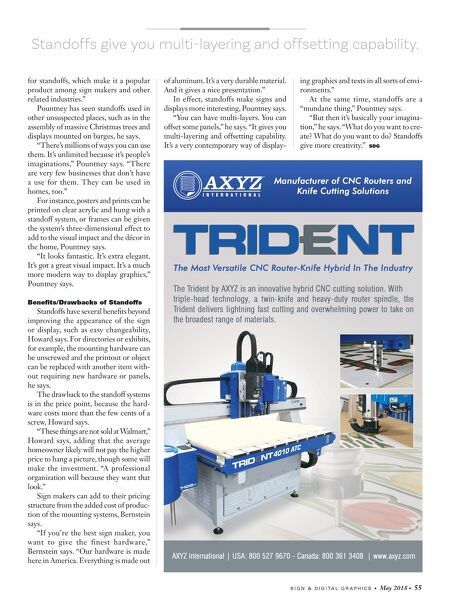 "It gives you multi-layering and offsetting capability. It's a very contemporary way of display- ing graphics and texts in all sorts of envi- ronments." At the same time, standoffs are a "mundane thing," Pountney says. "But then it's basically your imagina- tion," he says. "What do you want to cre- ate? What do you want to do? Standoffs give more creativity." SDG Standoffs give you multi-layering and offsetting capability.